From first dates to marriage proposals, alumni couples find lasting love as classmates. Graduates of UNT’s famously difficult fashion design program pursue high-powered careers. UNT alumna's acting talents shine in Oscar-winning short film. 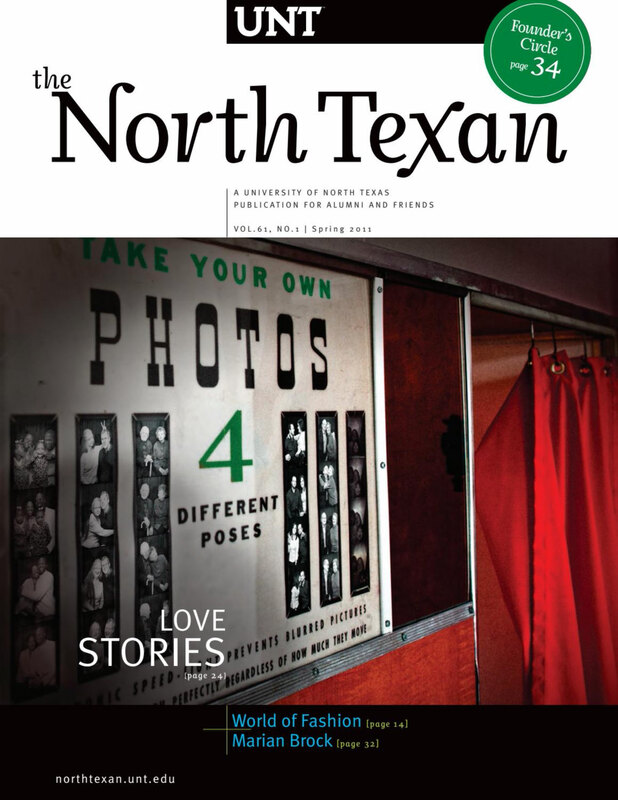 UNT alumna Tommie Phillips Harris recalls campus highlights during the Depression. The Mean Green men's basketball team advanced to Sun Belt Conference Tournament Championship final. Promise and possibilities mark the road to the future. In 1910, Wallace Newton Masters established UNT’s chemistry department. New Founder’s Circle recognizes donors whose contributions have a profound impact on UNT. UNT alumnus Darin Bradley earns critical acclaim for debut novel. UNT alumnus Ray Moseley finds himself at center of world events as a reporter. UNT alumna Carol West, ordained minister and counselor, earned a humanitarian award for leadership. UNT opens new center that serves as "urban laboratory" to solve contemporary problems. UNT’s Sky Theater hosts show featuring computer-animated images set to the band's music. Renowned pianist and music professor Joseph Banowetz was nominated for music's highest prize. UNT alumnus Alan Bigelow is a particle accelerator physicist and a guitarist. Soledad O’Brien and Hill Harper were among the keynote speakers at UNT’s conference. Plus, a new mobile site debuts and professor featured in magazine. Christopher Heiden, of UNT's College of Engineering, wins grant. UNT alumna remembers her French professor. The first five graduates of UNT’s Teach North Texas program received their degrees. .
From art to science, UNT researchers are changing the world. UNT's A Cappella Choir began in the 1940s as a way to grow the music department.